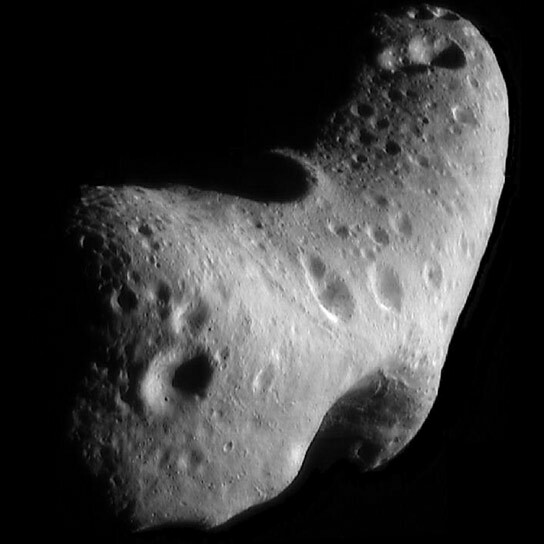 This image, taken by NASA’s Near Earth Asteroid Rendezvous mission in 2000, shows a close-up view of Eros, an asteroid with an orbit that takes it somewhat close to Earth. A new paper argues that the major cause of fragmentation for small asteroids, around one hundred meters in size, is not collisions with other asteroids but rapid rotation induced by radiation. A team of astronomers has revealed a new set of calculations for catastrophic disruptions of main belt asteroids, finding that for asteroids about one hundred meters in diameter collisions are not the primarily cause of break ups – rapid rotation is. Hundreds of thousands of asteroids are known to orbit our Sun at distances ranging from near the Earth to beyond Saturn. The most widely known collection of asteroids, the “main belt,” contains some of the largest and brightest asteroids and lies between the orbits of Mars and Jupiter. Astronomers think that the asteroids, like the planets, formed in the early solar system from the gradual agglomeration of smaller particles but that, in the case of asteroids, their growth was interrupted by mutual collisions that caused them to fragment rather than to coalesce into planets. This is an hypothesis which astronomers are trying to test by gathering new data. Their work has some immediate repercussions: NASA is currently planning an “Asteroid Redirect Mission (ARM)” as part of America’s next human spaceflight enterprise. Understanding the origins of asteroid sizes – and then identifying a good one for an astronaut to recover – are prime US goals. The discovery rate of asteroids and comets has increased in recent years thanks to new technology detectors. The Solar System today is seen as teeming with activity, and filled with related, evolving small bodies (including asteroids) whose orbits and sizes are shaped by gravitational interactions with the giant planets, but also by other forces like collisions and radiation effects. Radiation effects include the evaporation of water ice or other volatiles, differential thermal expansion, and radiation pressure — and they are critical when addressing the issue of asteroid sizes. Because asteroids are irregularly shaped, the pressure of incident sunlight and also effect of their own outward radiation (which is unevenly directed) can cause them to spin and, when the spinning is fast enough, to break-up. A “catastrophic disruption” is defined as the breakup of an asteroid into fragments each smaller than half the original mass. Traditionally small asteroids have been thought to be made in collisions between a parent body and a smaller projectile body, but these events seem to be very rare, both from observations and newer modeling. Renewed attention has recently been given to non-collisional break-up mechanisms like radiation effects, especially for asteroids smaller than a few hundred meters in diameter. CfA astronomer Tim Spahr and his colleagues have completed a new set of calculations for catastrophic disruptions of main belt asteroids, building on new survey results of faint (that is, probably small) asteroids. They find that for asteroids about one hundred meters in diameter collisions are not the primarily cause of break ups – rapid rotation is. Moreover, because the rate of collisions depends on the numbers and sizes of objects but rotation does not, their results are in strong disagreement with previous models of collisionally-produced small asteroids. 1 Comment on "A New Set of Calculations for Catastrophic Disruptions of Main Belt Asteroids"
Amazing–they discuss the importance of the Yarkovsky effect without once mentioning it by name!